Last month, we ran a meeting on joint working between industry and the NHS that benefits patients. Having delivered over 20 collaborative projects, we wanted to share what we’ve learned and find out more about the perspectives of our pharma and NHS colleagues. But we were also keen to run the meeting itself in a spirit of collaboration, because we know that working this way helps groups find common ground sooner. 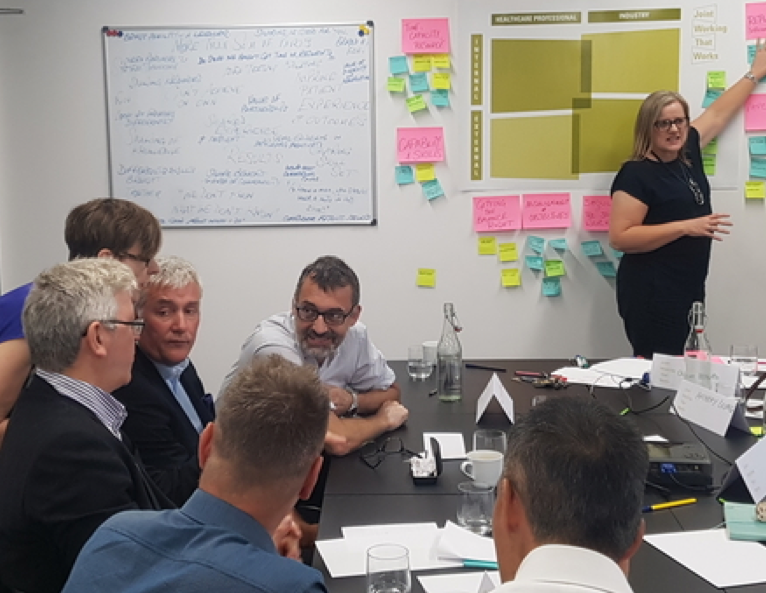 We brought together a group of experts from a broad range of clinical specialities and industry roles to look at the key elements of effective collaboration, as well as analyse the problems that can arise in a partnership project. Both pharma and clinicians see huge benefits to joint working. When it works well, the sharing of resources, knowledge and skills enables them to achieve things they couldn’t do alone. Asked to score joint working out of 10 in terms of the value it can deliver for patients, the NHS and pharma the group rated it 7.7, 7.1 and 7.5 respectively. Working with stakeholders on areas of commonality means that companies are able to achieve commercial goals while improving patient outcomes and experience at the same time; the results are more than the sum of their parts. What’s interesting for me is the value of the experience itself. Both groups reported that working together had helped them see the other’s viewpoint, and understand things they wouldn’t have otherwise. As one industry participant put it, collaboration helps you “walk a mile in your customers’ shoes, ” giving you fresh insights into the challenges of working in the NHS. The open and interactive discussion on barriers to joint working showed a striking similarity in the pitfalls experienced across both sectors. Issues include a lack of time, capacity and resources to set projects up properly; teams not having the right skills and capabilities to plan and manage joint working effectively; short-termism; misaligned objectives; bureaucracy and fear of reputational damage. For collaboration to succeed, keeping the patient benefits at the heart of a project acts as its moral compass, helping to ensure it delivers on shared goals. Patients could be involved in setting up or signing off project objectives at the start of the process. Goals need to be realistic, and adaptive mechanisms should be built into agreements, recognising that projects can evolve over time. Our delegates told us they found the collaborative experience at the meeting stimulating, insightful and fun. One senior clinician told us he thought joint working was ‘vital to the future of the NHS’ while others suggested additional tools and resources that could help upskill both pharma and clinical teams. We’re currently collating all the insights into a report. Contact claire@dovetailstrategies.com if you’d like a copy of this in due course.